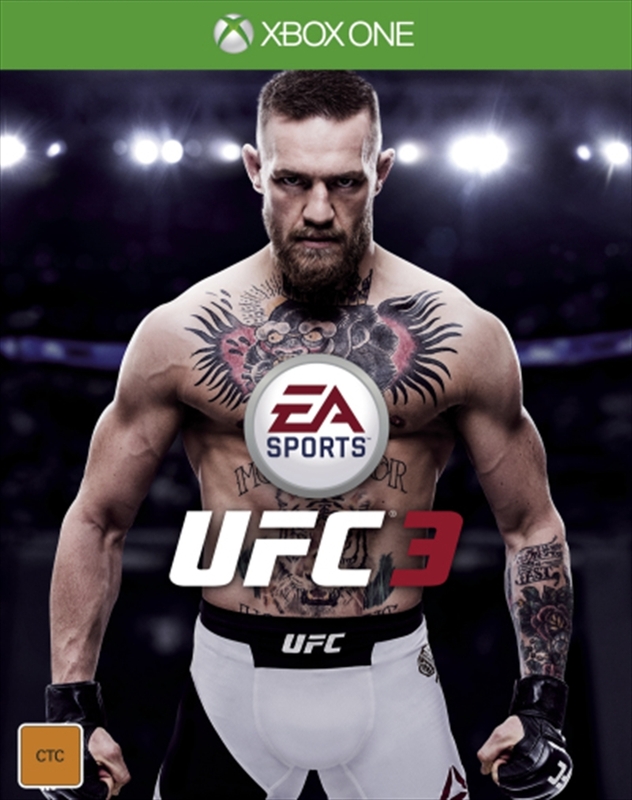 EA SPORTS UFC 3 revolutionizes fighting movement with Real Player Motion Tech, a new gameplay animation technology that delivers the most fluid and responsive motion ever. Every punch, kick, block, and counter has been recaptured and rebuilt on cutting-edge animation tech to look and feel life-like and responsive, delivering the most strategic, competitive fighting experience in franchise history. In G.O.A.T. Career Mode, players can build fight hype to gain fans, earn cash to train at new gyms, and create heated rivalries with other fighters to capture the world's attention. How you promote outside of the Octagon matters as much as how you perform inside of it as you progress to becoming the Greatest of All Time. In addition, an all-new suite of customizable multiplayer modes let you and your friends get into the Octagon and face off in fast, fun, intense bouts where a highlight-reel knockout is always one strike away and victory can happen in the blink of an eye. Real Player Motion (RPM) Tech is a revolutionary new EA SPORTS animation technology that sets a new bar for motion and responsiveness in the best looking - and now the best feeling - EA SPORTS UFC game ever. With over 5,000 new animations captured and rebuilt from the ground up, you can now move, strike, and create seamless combinations with the fluidity and freedom of the world's best UFC athletes. Players can now slip and strike while in full motion to execute dangerous counterattacks, adding new levels of strategy and competition to every fight. RPM Tech also recreates the styles of world-class UFC fighters, mirroring the precise look and feel of your favorite athletes like Conor McGregor, Georges St-Pierre, and Joanna Jedrzejcyzk. Introducing G.O.A.T. Career Mode in EA SPORTS UFC 3 where - for the first time - the choices you make outside of the Octagon impact your path to greatness inside of the Octagon. Outside of your fights, make promotional choices to build your fight hype, gain fans, earn more cash through big contracts and capture the world's attention. Create heated rivalries with other UFC fighters through the new in-game social media system, giving you the freedom to take on the persona you want between cool-headed contender or infamous trash-talker. Fuel the hype behind your biggest fights by balancing your time at the gym with promotional appearances that spread word of mouth and grow your fanbase. As you train, decide which gym to join, each with their own UFC training partners and unique moves to learn. And finally, watch it all come to life before your eyes in all-new Career Milestones showcased throughout your career, including press conferences, weigh-ins and authentic UFC programming like 'Bad Blood' and 'UFC Minute' hosted by Megan Olivi. Unlike any other sport, in the Octagon victory can happen in the blink of an eye. In EA SPORTS UFC 3 you decide how to fight and how to win with a whole new suite of game modes designed for fast, fun fights that are perfect for letting fists fly against your friends. Play Knockout Mode, Submission Shootout, Stand & Bang, or give your fighter's unlimited stamina in Fight Now Custom. In EA SPORTS UFC 3, you have the freedom to create and customize the rules of your match before you take on your friends. The all-new Tournament Mode lets you chase ultimate bragging rights among your friends as you attempt to take on as many opponents as you can finish in bracket-style elimination rounds with continous damage and fatigue. Ultimate Team in EA SPORTS UFC 3 introduces more personalization, strategy and collectibles. For the first time, combine your customized create-a-fighter with real life UFC fighters like Conor McGregor, Anderson Silva, and Demetrious Johnson to build the ultimate fighting roster. All-new Fighter Chemistry allows you to chase and pair specific moves that grant boosts to your fighter for a strategic advantage. New Ultimate Team Solo Challenges feature dynamically-updated singleplayer gameplay challenges that unlock in-game rewards, while new Ultimate Team Sets allow you to collect thematic items and trade them in for items of higher value. All packaged in a more streamlined experience with redesigned pack openings and visuals that make it easier than ever to build your very own Ultimate Team.